We are a few weeks into spring, which means it is time for spring cleaning. This sounds like an overwhelming process, but it doesn’t have to be. 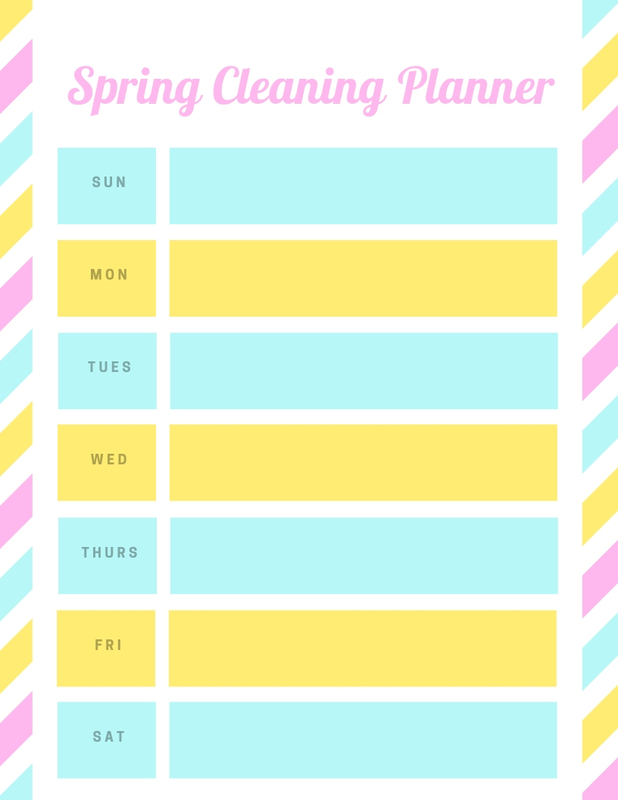 Take one week to dedicate to spring cleaning. This is the perfect time if you have child(ren) who are on spring break and you are staying home with them. Have a to-do list for your kids, and have them clean along with you. Hint: Make an organized space for misc. things that you own do not have a home,. If it causes clutter then opt to donate. 1. To get the motivation going, you can start with swapping colors. Put some light colored throw pillows on your couch, and top it off with a light throw blanket. The same goes for all the rooms in your house. Change the sheets and pillows & add the spring feel. The objective is to make your home feel nice, light, and fresh. This does not have to be expensive. Hint: There are plenty of items you can DIY. You can create your own pictures, print and frame. This is similar to what Ikea does with their pictures and frames. Sign up with PicMonkey for free using by clicking here. You can create all the pictures you want for free, print them out, frame, and display. 2. Organize under your sinks. This is a place that is often neglected and can become messy without the proper upkeep. Take everything out from under your sink. Give it a good scrub down. This is where a lot of mold, germs and bacteria live, so clean it well. Discard of any garbage. Condense multiple half used bottles into full bottles. This is where the fun part comes in. Organize under your sinks and the tops of your counters to your liking. I highly recommend bins and organizers. You can purchase quality & affordable organizers from Amazon.com. Below I have linked my favorite, Amazon Best Seller Organizer, Stori. You can also click below on “Best Sellers in Drawer and Organizers to get reputable information on products. 3. Clean out those closets! Again, my recommendation is to get out EVERYTHING and put it into one giant heap go through and decide what you will wear and what you will discard. If you have not worn it in more than 1 year, it is time to go-unless it is for a special occasion or business attire etc. You may chose to donate your clothes or sell them for a small amount of money (no guarantee that the business will accept your clothes. I recommend donating to a omen and children’s shelter. Put all of your clothes away and keep similar items together. When hanging up shirts, it is best to hang up by color, that way it is an easy go-to selection when you are getting ready. Hint: If your child(ren) are with you make this a family project. 4. Organize those drawers. I think the best thing to do here is to make your space as clutter free as possible. Check out this desk and drawer organizers. 5. If you need to organize papers, I suggest to create files, label them and put them into a condensed box. This box should not be in your bedroom. The bedroom is a sanctuary. When you see papers in your room, you are likely to get stressed out during times when you are unwinding. This method costs $5 or less. Be sure to label and organize accordingly. 6. Overall deep clean. Dust everywhere in the house, clean out the fridge of old food and give it a scrub inside and beneath, clean the creases in your shower, sanitize your dishwasher, sanitize your washing machine and get all the dirt around behind it. 7. Get anything you may have missed- under the stove, the creases in the floor, organize your book shelf, change out pictures etc. Hint: Top off your freshly cleaned home with essential oils. Health, LifestyleHannah Silverman April 18, 2019 cbd, koi, koi cbd, cbd juices, cbd for animals, cbd for dogs, cbd beginners, cbd for anxiety, cbd for depression, cbd for illnesses, cbd multiple sclerosis, cbd ptsd, discount, coupon code, military, military safe, is it?, what is?